Today I am giving a talk at Podcamp Pittsburgh about Blogging Grief. This is a repost of one of my earliest posts about Gabriel, in November 2007. He was already 4+ years gone, but that doesn’t mean this was easy to write. It’s still not easy for me to read. And, fair warning, there are pictures at the end. They may be tough viewing. 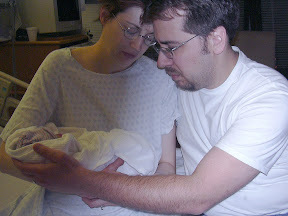 On June 4, 2003, I had a pre-natal visit. I was pregnant with our first child. Everything seemed to be going fine. Twenty-four hours later we were a long way from “fine”. I first noticed that the baby was quieter than usual that evening, June 4. I didn’t think too much of it because I had literally just been at the midwives and had heard his heartbeat (at the time, we didn’t know he was a boy, and we didn’t have the name Gabriel picked out). But even after a vanilla milkshake from Bruster’s with a banana added that night (can’t drink those anymore; frankly it’s a wonder I can visit a Bruster’s at all), he wasn’t kicking around. The next day, I went to work. At the time I was working part-time as a receptionist at a hair salon, and as a freelance writer. I had decaf coffee, a Pop Tart, and then some grapes. Nothing from the baby. 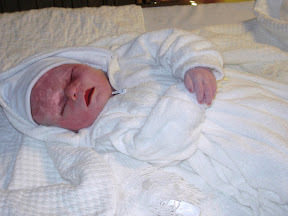 I called the midwives, and told them my concern, that I hadn’t felt the baby moving. It had been less than 24 hours since my appointment. They were mystified. The midwife I spoke with suggested I have a high-carbohydrate snack and see what happened. I explained I had already done that. She asked if I would like to go to the hospital so they could find the heartbeat or do a sonogram. We really thought everything was fine at this point. I could say something dramatic like, “I already knew my baby was dead” because in retrospect I know that now. But I didn’t think he was dead. I just thought he was quiet. The worst moment after the worst words: When DearDR rushed into the hospital room with “that look” on his face. “That look” was so lost and scared and vulnerable. It was the look, that when you see it on someone’s face after they’ve lost someone, that you want to say, “I’m so sorry” or — worse — “It’s going to be okay.” And I couldn’t say either of those things to him. I was sorry, sorry for all of us. But it certainly wasn’t going to be okay. The worst pain: After the epidural wears off, and they won’t bolus it anymore because the next time they turn up the pain meds, it’s because you’re getting a C-section. The worst memory: Not having much of a memory of the hours after they hook you up to a morphine drip. The worst of everything (aside from the obvious): The look on everyone else’s face. The expression of sorrow and pain on most, and the resolute expression that your father has because he’s here to comfort you, and the pity on other faces, and the fear that everyone is hiding because why is this taking so long and why don’t they just do a C-section already, and if I have to be here one more day I’m going to lose it. The force of good cheer some of your visitors bring with them mistakingly thinking this helps you be strong. The second worse: The waiting. The pain. The drugs. I delivered Gabriel on Sunday June 8 at 2 a.m. in the morning (that time is not exact). It was Pentecost Sunday. And the Spirit did. I would be lying if I didn’t add, I wish I hadn’t needed the Spirit quite as much. God could have kept the Spirit if I could have had my son. It was, indeed, the darkest hour in my life. I am pretty sure DearDR would second that. Gabriel was 5 pounds 4 ounces and 21 inches long. He was a beautiful baby — he truly had the most gorgeous hands, with long, long fingers. I wish I knew what color his eyes were. I wish I had heard him cry. I could fill pages and pages of all that I wish in relation to Gabriel. You get the idea, I’m sure. If you are a parent; if you have lost a child. You know. Gabriel was the name that DearDR and I picked before the morphine hook-up, when the epidural was still working. We picked a girl’s name, too, but I don’t remember what it was. Gabriel means, “gift of God”. And if that sounds weird, well, I’ll explain it another day. I’m pretty wiped out right now. After the Day of Reprieve, Dan and I headed back to the hospital to start induction. I had confidence in what we were doing, and even though I hated the monitors and IV I had to be hooked up to, I figured by sometime on Tuesday, I would deliver a baby. My baby, on the other hand, had other plans. I don’t know why I expected things to go… either smoothly OR as expected. The only one of my inductions that could be said to go well was the one for Flora, and a sunny-side up baby and three hours of pushing can’t exactly be called “smooth”. So, Monday night, checked into hospital. Tuesday got my breakfast, which consisted of liquids and strawberry gelatin. The thing about a planned delivery at the hospital is they don’t let you eat real food. It’s a worst-case-scenario type of mindset. And to add insult to injury: I got decaf tea instead of coffee. Dan and I settled in for a day of induction. The pitocin started. And it didn’t do much over the next, oh, 10 hours. My cervix effaced but didn’t dialate. The contractions ramped up toward the end of the 10 hours as they turned the pitocin up, but my body simply wasn’t responding. We decided to turn everything off, pack everything up, and head home. And hope for natural labor to kick in over the next week. Turns out, we didn’t have to wait very long. After they turned off the pitocin, my contractions spaced out to about 4 or 5 minutes apart. They had gotten brutally strong over the last hour or so, and I expected them to taper off. I was tired, starving, sad and frustrated. I had a contraction about four steps out of the room door. A few feet down the hallway, I had another. Dan said, “That wasn’t five minutes.” He whipped out his smartphone, and started timing my contractions with the stopwatch app. I won’t give you all the gory details. Suffice to say, after about another hour of hard contractions (and they still wouldn’t feed me), I asked for an epidural. Dan and I slept, and things continued to move along. They broke my water at midnight. Around 3 a.m., my epidural started to wear off. I was about 7 centimeters. That was kind of news to me. I wasn’t feeling very strong contractions, which was going to make pushing challenging. *TMI ALERT: You may want to skip the rest of this paragraph. * I hadn’t dialated all the way, either, but my cervix was thinned out enough that the midwife could just stretch it the last three centimeters. I started pushing at 3:30 a.m. I was using more muscles than I had ever used before (and felt it for days afterward). Everyone was shouting encouragement. (Okay, maybe they weren’t shouting, but it seemed like it to me.) I asked for some ginger ale, because I was desperately thirsty and I needed a sugar rush. I got it, too. At 4:48 a.m., Michael Timothy came out crying. Because of the heart decellerations, there were pediatricians waiting to see him. After I got to see and touch him, the nurses took him to the peds (right in the room); Dan went over with him. The nurses got me cleaned up, and brought the baby back to me. As if we hadn’t already thought about it, this labor was certainly enough to convince me that we are not going to have another baby. I’m okay with that. Michael feels like an appropriate bookend to his brother, and I’m ready to close the chapter on childbearing. Now it’s time to focus on child rearing. God help us all. I would like to formally welcome Eve Monica into the world (because that’s how we formally welcome our friends’ babies these days – on our blogs…). Little Miss Eve, I cannot wait to meet you and hold you, and tell you crazy stories about your mom and dad, dear friends of mine whom I love so much. We’ve waited a long time to meet you. J & P, I am so happy for you! Welcome to parenthood. All the clichés are true. Don’t forget to relish in and marvel at all the wonder that is a baby. And breathe! The same day Eve was born, I stumbled onto this post from reading over here (A Little Pregnant). Although I myself have not struggled with infertility, I have had a different tragedy, just like the mom at I Will Not Fear Love, Julia. I found this post especially moving because this has been how I have been feeling since J announced her pregnancy. When DearDR called to tell me Eve was born, I cried. In happiness, to be sure, and also in overwhelming relief. Because I could let go of my fear for my friends. I haven’t shared this with J because, as Julia notes here, to be aware of what can go wrong – what does go wrong – can make you feel like a freak. Pregnancy and birth are beautiful, joyous, miraculous things, and living with the dread that a baby will die before he or she is born… is … in a way … well, it’s a real bummer, to put it mildly. But I don’t think it makes us freaks. We just have different frame of reference to what is usual in the case of having a baby – especially a first baby, as Gabriel was for me and Eve is for J. Our frame of reference is painful, devastating and sad, but it’s not wrong. I have perceptive friends, and although I never told J about my fear for her and her baby (the fear I have for all of my friends and family who have had babies since I lost Gabriel), I am sure she knew that my happiness and joy for her were colored by my loss. She’s no stupid lady. She was there the night Gabriel was finally delivered. Within her own frame of reference, she lost a baby, too. So Julia, I don’t think we are freaks. I think we have to be careful about what we say about our losses and how we say it. And to whom. But I also think we have to own our tragedies, and count our babies – every one – when talking about our experiences. For many of us, the mothers of lost children, the sadness and dread and terrible knowledge linger forever. That’s okay – it is, to use another word, appropriate. And for many of us, who are lucky to have successful pregnancies, another truth is: Joy abides. Eve, J, P: I wish you joy. To say my third pregnancy was unplanned is quite an understatement. I didn’t even realize I was pregnant with Bun for quite a while. I had just started a new job; DearDR was going to quit one of his jobs to start studying for his license test; and we also went on vacation. We’re pretty sure that’s when Bun was conceived. Talk about letting your guard down. To say that Bun had no intention of leaving her warm home is an understatement, too. I was in the hospital for five days, total. We check in on a Wednesday night, January 3. They place the Cervadil, and give me something to help me sleep. At 1 a.m., they remove the Cervadil because the baby’s heartbeat dropped. They start Pitocin. It is turned up very slowly for two reasons, the primary one being a staffing shortage. The secondary reason is the false belief (on my part) that since I had done this before, once things got rolling, they would roll quickly. My induction with Monkey only took about 24 hours from start to baby. I am feeling contractions, but they don’t get stronger. My cervix isn’t moving; it’s about 2 centimeters dialated, and it stays there all day. I try to move around to get gravity working for me, but that’s hard to do when you’re hooked up to machines and IVs. To further discourage and depress DearDR and me, we are in the room on the labor and delivery wing closest to the double doors onto the wing. These doors make a huge, loud sound every time they open: KA-CHUCK KA-CHUNK. KA-CHUNK KA-CHUNK. Twenty-four hours a day, not as often at night, but still often enough. Thursday night rolls around. I want to try to get some sleep. We turn off the Pitocin. I haven’t slept well because of the damn doors. But I’m game to try more Pitocin, maybe try getting it turned up more often. Staffing shortage means I don’t even get started until almost noon. The contractions are distant; my cervix still isn’t moving. I’m having a hard time staying focused, and not becoming despondent. Around 8 p.m., my midwife checks on a few things. The cervix has opened a little more, but the contractions still aren’t increasing. This whole time, by the way, Bun’s heartbeat is just fine. My midwife makes a suggestion about trying to drop the baby’s head more directly on the cervix. It seems that Bun is hanging out on my bladder — which would explain why I have to pee every ten minutes. I think we also decide to break my amniotic membranes. I start doing these funky moves on a stability ball, and alternately leaning against the wall in a standing position. At 10:30 p.m., my contractions go from distant to RIGHT THERE in the space of about 10 minutes. While I am relieved that it seems I am going to have a baby after all, I am tired, people. I am also thinking about pushing Monkey for three plus hours, and I know I don’t have it in me. I ask for an epidural. The midwife says she is going to wait and ask me again in 30 minutes. I am handling the contractions okay, but not great. I want a rest. The midwife asks if I still want an epidural. I say yes. I get one. Peace and loveliness. I can still feel my contractions (although not my left leg…), but they aren’t stressing me out. I get some rest. DearDR and I chat. The midwife and the nurse hang out for a while. About an hour after the epidural, I am told to start pushing. Thirty-five minutes after that, Bun enters the world. They clean us up; we sleep and feed; and get moved to another room; and sleep and feed some more. And then we get to go home. I am so happy to be home. At 32 weeks of my pregnancy with Monkey, I started going to the hospital weekly. I received non-stress-tests and a sonogram. They wanted to monitor me and the baby because of Gabriel’s death. At the first sonogram at this time, low levels of amniotic fluid were discovered. Very low. In lay terms, the baby makes the fluid. Low levels indicate a possible problem with the kidneys, the bladder, or, as seemed to be evident in my case, the placenta. As the perinatologist, Dr. T, explained, if something is wrong with the placenta, things go into conservative mode. The most protected areas of the baby are the heart and the brain; everything else is expendable. He further explained that Mother Nature was much more interested in my survival than the baby’s. That selfish b*tch. So steps would have to be taken. That may not sound like a lot of water. But try this: drink four cups of water in an hour. Then another four cups the next hour. All Day Long. There were nights that DearDR would come home, and I would be sitting or laying on the couch crying with a glass of water in my hand. I just didn’t want to drink any more that day. Even varying the liquid — seltzer, lemonade, caffiene-free pop — didn’t help all the time. I did, however, take to the bed rest, which surprised me because up until that point I had active pregnancies. I walked a lot with Gabriel, and to this point with Monkey. But I had just taught myself to knit, so I knitted the baby a blanket. I read out loud to her, all seven of the Chronicles of Narnia. I occasionally napped. All in all, it was a peaceful time, a time for which I am more grateful now. Once the babies come, that quiet is hard to come by. As many of you, my readers, already know! Fast forward six weeks. I’ve delivered Monkey under some tough conditions, but here she is. I am swollen up like a balloon from the intraveneous fluid you get when your labor is induced. I am dressed and ready to go; I cannot stop touching and looking at Monkey. She is wrapped in the blanket I knit for her. I am ready to get my shoes on and go home. This proves to be challenging because my feet look like feet-shaped water balloons. DearDR manages to shove my shoes on them. I start crying. He is alarmed (and probably really tired, too; he hasn’t left me and Monkey for an instant). “What is it?” he asks. DearDR hugs me, hugs us both. Then we all go home. Grief is a strange beast. It ebbs and flows; it buries you. Days you can’t breathe for grief, and when it ebbs, you don’t feel relief, you just wonder when it will become too great to bear again. I know for a long time after Gabriel was gone, I kept thinking: This is not my life. I would wake up at night and listen for the baby. I would wake up in the morning, and before the truth hit me — again — I would think, “Oh, it was a bad dream.” I thought that any moment I would really wake up and find the nightmare over and Gabriel would be with us. I kept thinking it was a test, a trial. That after we passed — however you pass a test like that — our son would be returned to us. Like God or the universe was playing a prank. A tasteless, crappy prank, but it was easier to believe that than that our Li’l Bean, as we had called him through the pregnancy, was truly gone. Was dead. Was buried in the ground, in a casket smaller than a bassinet. The bassinet that we had had waiting for him. I had listened to that heartbeat for 37 weeks. How could it have stopped? This was not my life. Each year, half a million babies are stillborn. Can you believe that number? 500,000! Dan and I were stunned when we met with the perinatologist and he told us that statistic. I mean, we knew it could happen, but that it did happen that often was… surprising, is as good a word as any here. In half of those half million cases, a cause is never found. Such was the case with Gabriel. There are some theories as to why we lost Gabriel, but at the time, no answers. And nothing that said to us, “Don’t try this again.” No genetic abnormalities; his cord was not wrapped around his neck; no other trauma or reason. He just died. Before he was ever born. The grief washed over us. And even as the days and weeks and months went by, even as I didn’t spend as much time literally crying, the grief didn’t leave. Four plus years later, two healthy daughters later, the grief is still here. I own it now though. I know this is my life. And while I have accepted that, and I take so much joy in my family, I feel Gabriel’s absence every day. I still cry. And then I go and hold my little girls and my husband, and I let them heal me. I gave birth to a healthy baby girl. That’s you, Monkey. When I discovered I was pregnant again, nine months after we lost Gabriel, I had a curious feeling: very quiet, very calm. I felt the part of me that wanted to be fearful, and I stoically closed that door. What came into my heart instead was the feeling of strong faith. When people asked, “Aren’t you scared?” I answered, “I have a lot of faith.” I did have faith: in my midwives and doctors, in me, in God, and, most especially, in you, Monkey. I just had the belief that your heart would not break mine. To say that my pregnancy with Monkey was joyful would not be correct. We were so wounded, still. To say it was completely without anxiety would be overstating it, too. But there was the quiet whisper of faith. It sustained me — and in turn, DearDR — through 38 weeks. Through anxious sonograms and non-stress tests. Through the discovery of low amniotic fluid and modified bedrest. Through gallons and gallons of water that I quickly grew tired of drinking. Through the blanket that I knit for you while on that bedrest. DearDR and I entered the hospital on a Wednesday evening to begin induction. Pitocin would be started the following morning, and I would be tended by the midwife on call. My labor seemed to progress very quickly, but I don’t remember a lot of pain. At about 8 hours, I got to the pushing contractions. I started to push. I remember feeling a rush of strength, of triumph. She was “sunny-side up”, meaning that her face was toward the ceiling. It’s not the optimal position for a vaginal birth. The perinatologist on call, Dr. C, came in when I was about two and a half hours into pushing. She assessed the situation, talked to my midwife and DearDR. She probably talked to me, too, but I really don’t recall. I remember talk about vacuum forceps, trying to turn the baby, and the dreaded “c” word — Cesarean section. Dr. C attempted to manually turn Monkey. It was the worst pain I had ever felt in my life — and I’m in labor here. She tried again. I begged her to stop. I was laying on my back with my legs spread hell-to-breakfast, and I could see her getting ready to try it again. My midwife had one of my legs, but the other one was free. I took aim at Dr. C’s head, because I fully intended to kick her if she hurt me. DearDR saw my face and grabbed my leg. I was pretty close to hating him in that moment. I determined that Dr. C would not be right. She didn’t think I could push that baby out. I proved her wrong about half an hour later. At 11:11 p.m. on 11-11-2004 (not kidding) I pushed Monkey into the world. Her eyes were wide open. And now you are three years old, Monkey. Happy Birthday. You are one of two of the brightest lights in my life. I love you. Today is the first day that I am going to write about being pregnant with Gabriel. I’m not going to spend a lot of time on my pregnancy, for obvious reasons. I got pregnant a little over a year after DearDR and I got married. It was a little sooner than we had expected, but no less welcome for that. I chose a group of midwives in my area; I had an uneventful (until the end) pregnancy. I had a fabulous pregnancy. I was so happy to be pregnant; the hormones were good to me. I was enraptured with the miraculousness of it all. In lieu of making this up as I go along, I am going to quote some passages from the last month of my pregnancy from my journal at that time. Because I am “this way” about punctuation, I have to say that the ellipses I use are indicative of skipped words, not the way I actually write in my journal. In retrospect, how naive it sounds, yet how hopeful. “I think about the future fabric of our lives: you, with your work and the teaching; me, with the children and my writing, the articles, my quiet poems. What a view this is, this simple life, not one I imagined ever…. “To the baby, our li’l bean, 8 weeks before your birth: when you move within, I have such great joy. I didn’t expect this; I didn’t expect you…. Your father wants to meet you, wants to see your face. I have a different desire, if I can try to articulate it. It is not that you not be born, but that you are, and that I can carry you the way I do now forever, at the same time. It is a selfish wish: that I remain your whole world, your only sustanence. that I nver have to give you away, or worse, say goodbye. “I address you often, both in my head & aloud. I’ve gotten used to the names we’ve chosen, even attached to them. I think of the Bible, of God saying, I knew you before you were born. “I know you…. I don’t know your face, but I almost do. I dream of it sometimes, of holding you, looking down at you. Sometimes you are asleep, and dreaming of me, too. Sometimes you are looking back at me with the knowledge of the angels in your eyes. “26 days until l’il bean’s EDD. who knows how much time will come, will go, before you come into the world. You are deeply head down in my womb — and I worry about your head getting squished. … is that silly? … you seem to be measuring a week or two behind. Is that a concern? You’re active enough — I seldom am compelled to sit & count your little movements, your rolls & stretches & kicks. There are plenty at any given time. “[The midwife] poked around to find your position & started a little contraction. I’ve been having some of those, nothing very painful, though. I have discovered a couple of women through NaBloPoMo who have started me considering a theme for this month of many, many posts. It is not a happy theme — but then, this is not always a happy weblog, right? Although I set out to be humorous, it seems to me that mostly I’m a little bitchy; occasionally I’m funny; and I mention my faith quite a bit. But I would hate to be lumped in with any particular group: funny moms, or Catholic moms, or whatever. The two women are Birdies Mama and Niobe. Their blogs have moved me; their stories — which are a version of my story — have affected me. And there are many more women out there like them — like us. And I haven’t found them until now. But I am hesitant to blog primarily about Gabriel, my stillborn son. One of the reasons — two of the reasons, I should say, are Monkey and Bun. I take such delight in them, such joy. Shouldn’t I write about that? When I was pregnant with Gabriel and after we lost him, I wrote extensively in my journal. This was more than four years ago now, way before the weblog phenomenon. I also wrote “publicly” about him, as it were; at the time, I was very active in Pittsburgh’s poetry scene. I attended workshops and classes and had readings; I published. I haven’t done very much in that vein since Monkey’s birth. I wrote, read and published a number of poems that were specifically about my experience of Gabriel. He has also been mentioned here, and of course at this very blog on the anniversary of his death. But now I want to tell Niobe and Birdie’s Mama about him. And others, too, others that I am just discovering. And, let’s face it, it’s better than bitching about potty training and/or frustrating times with DearDR. Right? I am trying to get this button over on one of my side margins, but as self-evident as the instructions for doing that are here at WordPress, it still isn’t happening. Maybe someone has a suggestion? Guidance? Thanks.